He requested the quilt be soft and snuggly, so I used 100% cotton batting and "Fascination", a quilting design that is more open. 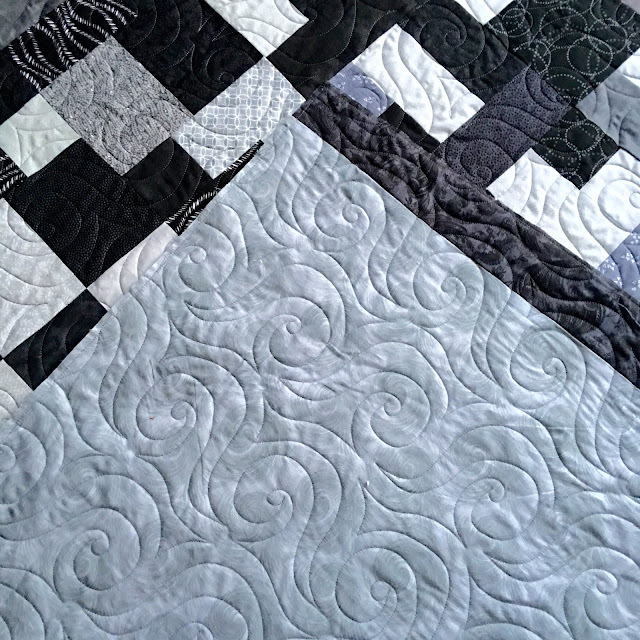 Gail used the longtime favorite quilt pattern, "Yellow Brick Road". This quilt measures 113" square with a backing of 120", which is the maximum I can load on my 12 foot longarm. Gail had to add more fabric to the extra-wide backing to bring it up to 120". 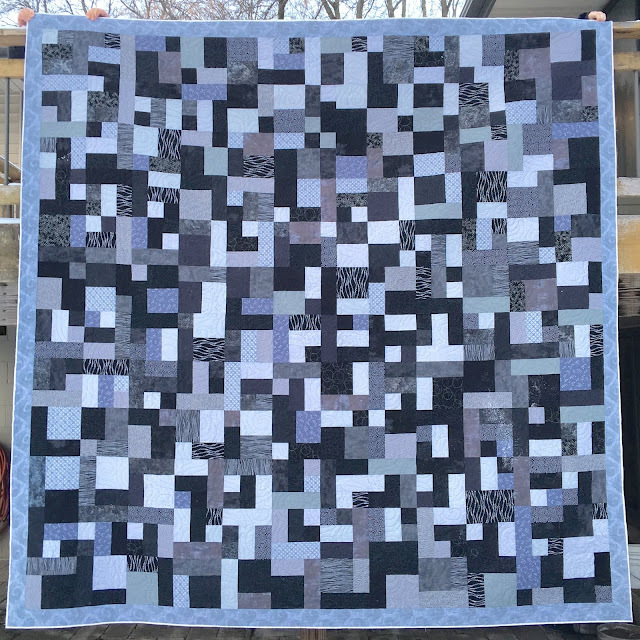 All of the fabrics in this quilt are grey or black, a very modern look. As large as it is, this was a nice, flat, square quilt to work with. Great job, Gail!!! He is a lucky grandson to get such a large quilt gift. Nice quilt. Yellow Brick Road is one of my all time favorite patterns. It's a classic. Perfect quilt for a guy! 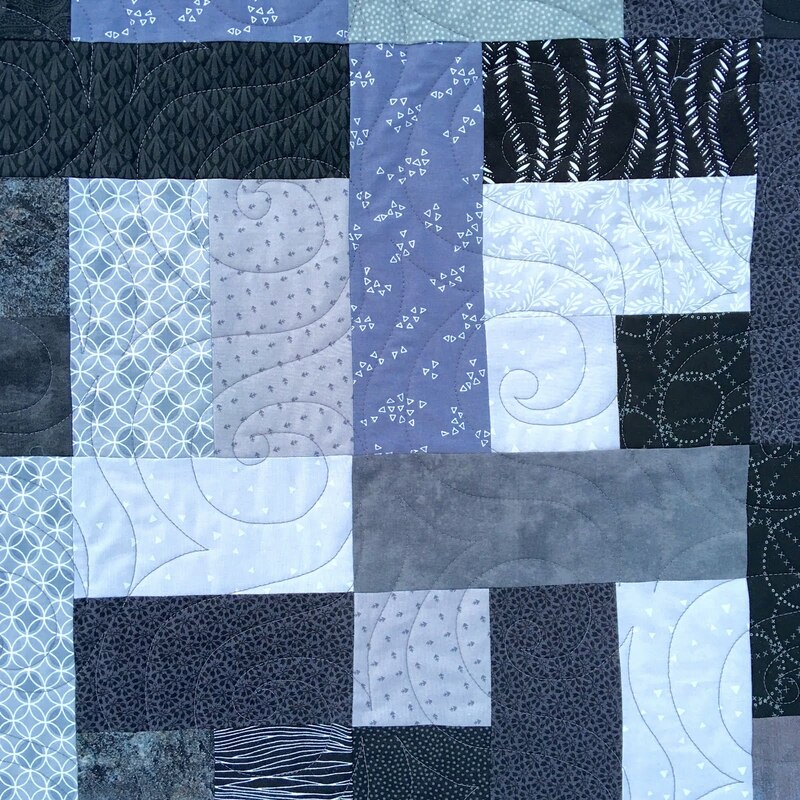 Nice quilting too! This quilt will look great on a guy's big bed. I like how the swirly quilting enhances the pieced design and gives it movement. He is lucky indeed, I love it too. Wow! It is a huge quilt! You know, I'm learning so much reading your blog. Swirly quilting certainly softens the angles of this quilt - and makes it look so soft and cuddly! Nice job! That is a huge quilt!! I love how it has a pixelated vibe about it! I'm sure he'll love it! 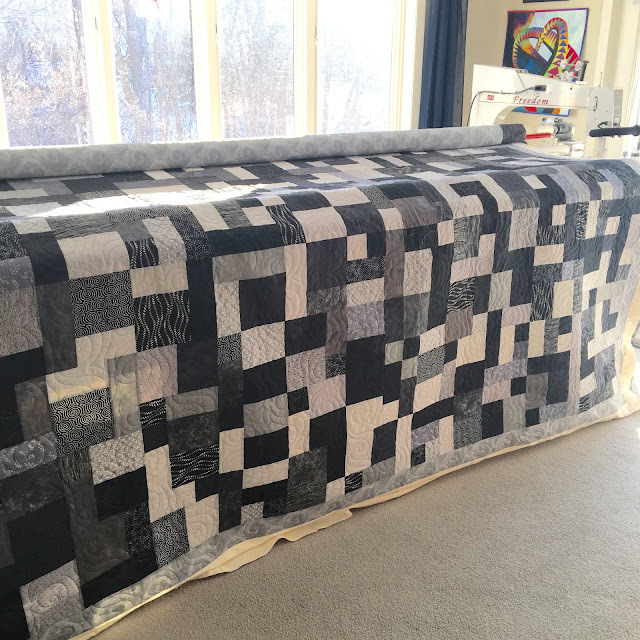 One ginormous quilt! 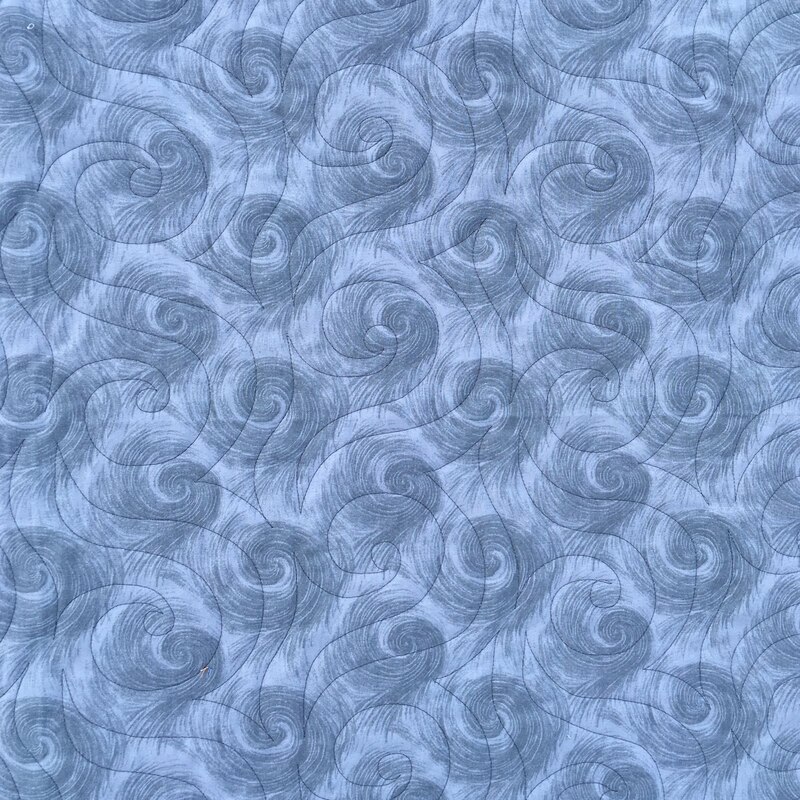 Love the pattern you chose to quilt with - looks as cuddly as requested! 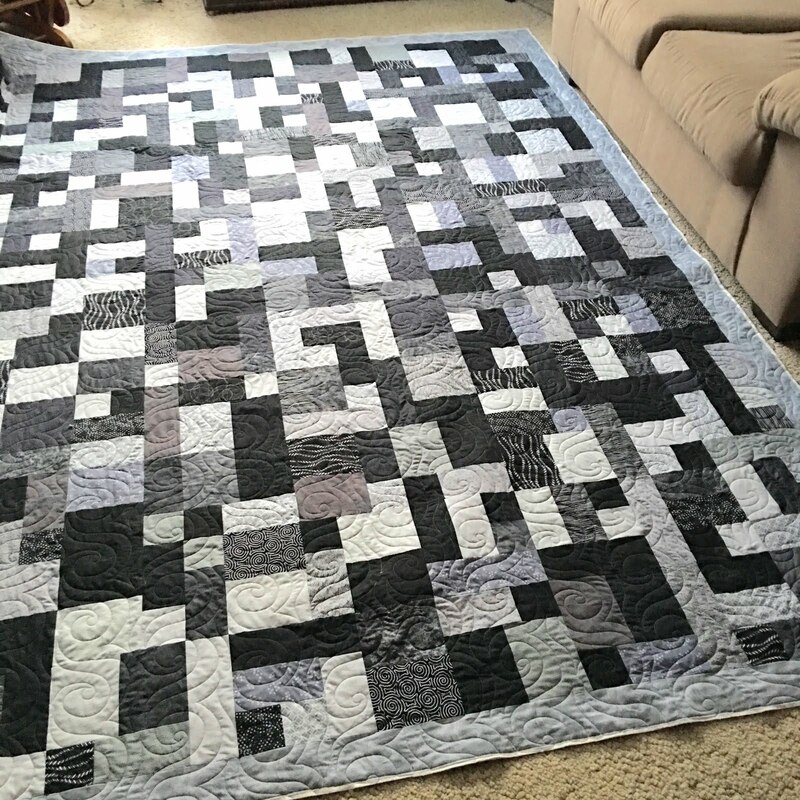 That is one huge quilt, but just lovely in all those shades of grays. Very nice! Great quilt for a guy!! Yellow Brick Road is one of my all-time favorite patterns; when it first came out, I couldn't stop making them. I haven't made one in a long time and now after seeing this quilt, I think it's time to make one. Love it with these fabrics and of course the quilting is just perfect. It looks wonderful and has been finished beautifully. Even though it has black in it, it is still a very subtle looking appearance. Great work. What a generous gift!! You don't see too many YBR quilts these days. Quiltmaker and quilter BOTH did a fabulous job!! I like this quilt a lot! I did not recognize it as Yellow Brick Road! It's awesome. The quilting is just right!